“Frustrated with their current jobs, Uday, Adhyayan, and Rajasekaran team up to start an innovative business, non-existent in India until then. Ignoring all pragmatic aspects of life, they chase their dreams with immense pleasure. However, their journey is no cakewalk, as they confront financial crisis and rejections soon. Uday plays a business trick to triumph over that uninfluenced market; it works initially, but soon boomerangs, blowing the team apart. The police arrests Uday accusing him of illegal activity by his organization. Were there any blemishes in their plan or was it just a typical Indian market, reluctant to accept an un-experimented concept? Will they be successful in implementing their innovation, staking their hard earned money, stable jobs, relationships, and life? ‘S.O.A.R is the story of chasing a dream, quandary between desire and responsibility, friendship and love. 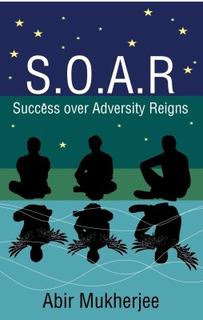 REVIEW- S.O.A.R is the one of the best book i have read recently. A book with perfect title (it couldn't have been better) and plot. Abir has the great ability to narrate a story. Language is lucid and simple, though it is simple, book has best dialogues wherever required. Though there are some tamil and bengali words without their meaning given but it is overcome by the strong storyline and pace. Character's are justified well, with the perfect happy ending. There are some errors in punctuation and spelling which are unavoidable. Blurb should have been shortened as it reveals the suspence.